Walmart said Wednesday that it's cutting 7,000 positions. The retail giant -- which employs about 2.3 million workers worldwide -- said in a statement that the cuts affect accounting and invoice jobs in its U.S. stores. The company said affected employees will have the option to work in another role at Walmart. Communications director Deisha Barnett said the company is "anticipating that associates move into new roles" rather than leave the company. Walmart said some people may have the opportunity to transition into higher paying roles -- like assistant store managers -- while other roles may pay less than their current salaries. The transitioning process is expected to extend into 2017, a Walmart spokesperson said. Barnett said the positions are being cut because Walmart is implementing a modernized system for bookkeeping and tracking inventory. New roles have opened up thanks to the pick up service Walmart launched last year, and CEO Douglas McMillion's focus on bettering customer service by putting more employees on the floor of its stores. 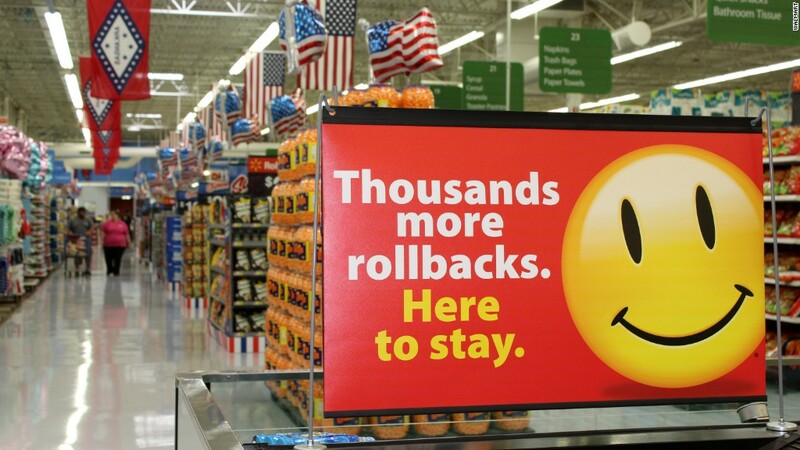 Walmart already cut some back office jobs at 500 stores in June in what Barnett called a "pilot program" to test out the transitioning process, and the company was "very happy" with the results. Walmart could not immediately provide data about how many of those workers stayed with the company or took roles that paid more or less than their prior position. Walmart (WMT) has been hit hard by competition from online shopping sites, particularly Amazon, and the company has announced store closures and job cuts multiple times over the past year. But in 2016, Walmart has buckled down on revitalizing its business. It cut costs by shutting stores, given wage hikes that have boosted workers' morale, and recently acquired Jet.com -- an online retail site -- for $3 billion. In Walmart's most recent earnings report earlier this month, the company reported that those moves have paid off. It beat analysts' expectations by posting U.S. sales that grew by 3% from the same quarter last year, and earnings per share rose by 12%.